Landscape package contains tools to handle a variety of pruning jobs. Using pole adapters, the pruner and pole saw snap into the hollow core fiberglass poles for a secure connection. Adapters allow user to replace pruner head or pole saw quickly and easily without tools, using the same pole. Tri-cut saw blade for quicker, cleaner cut. Tbook.com crawls the web to find the best prices and availability on Tree Pruners and related Tools and Hardware products like Jameson Landscaper Pruner and Pole Saw Tree Trimming Package with 8 ft. Pole. For this page, related items include products we find that match the following keywords: "Tree Pruner" at our vendor partner Home Depot. 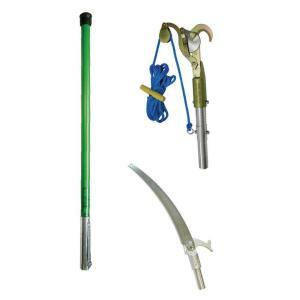 Jameson Landscaper Pruner and Pole Saw Tree Trimming Package with 8 ft. Pole is one of 75 Tree Pruners and related products listed in the Tools and Hardware section of Tbook.com If you have any questions on this product, please give us a call at 734-971-1210 during the hours of 9am - 5pm EST for assistance. Thank you for shopping at Tbook.com, the Internet Department Store!